This is very interesting Mistake Finding Freecell Solitaire Card Game Puzzle. This is very tough mistake finding puzzle. Only a Genius person with keen observation can solve this Mistake Puzzle. Here is snapshot photo taken from Freecell Solitaire Card Game. There is one mistake in this Puzzle Picture. Give your best try to find the mistake in this picture before looking at the answer? Only Genius will be able to find the mistake in this picture! 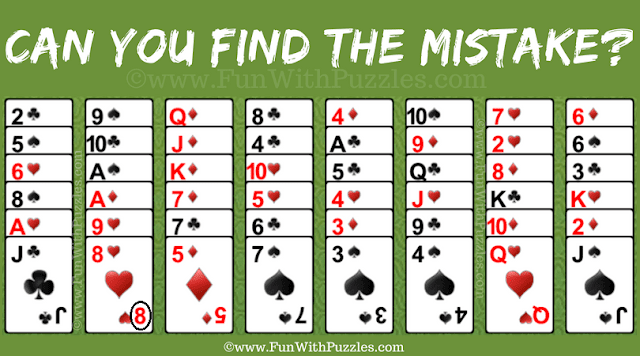 Answer of this "Mistake Finding Freecell Solitaire Card Game Puzzle", can be viewed by clicking on button. Please do give your best try before looking at the answer. The Answer is marked in the puzzle picture below. One has to look the orientation of '8' very carefully to understand this mistake in this picture. To solve Freecell Solitaire game you require your little bit of your Maths skill, little bit of luck and more of Logical reasoning. Do checkout below mentioned puzzles which will test your Maths skills, Logical Reasoning and Knowledge of English language. Tricky Maths Mind Game Brain Teasers with Answers and Explanations: These are very nice Tricky Mind Maths Games to test your brain for Mathematical skills and logical reasoning. Odd One Out - Fun Letters Quiz for Kids: Can you find Odd One Out? These are Out letter Out puzzle quiz in which your challenge is find the letter which is different from other letters in the given group of letters. Cool Abbreviation Brain Teasers for Kids with Answers: In our daily life, we come across different abbreviations. Do you know what these abbreviations stands for? Do check it out yourself. Missing Vowels Brain Teasers for Teens with Answers-Vegetables: At last here is very easy quiz on missing vowels in which your challenge is to find the name of the missing vegetables by fill in the blanks with vowels only. Is there a way to play solitaire without downloading programs I DO NOT want? Try changing your browser and do let us know if it solves your problem.